UPDATE: A couple seasons after starting this thread, I came across a LiquiVac vacuum oil-extractor unit in a garage sale for five bucks. It turned out that it no longer held a vacuum, but I was able to cobble a workaround using a FoodSaver vacuum unit that we have. Bottom line: That method is so much easier--and very thorough--that I no longer go through the steps described below. It's your choice, but, boy, what a difference! I see that on this thread someone has said that vacuum systems don't get all the oil. Maybe, but I've found that repeating the process several times until no more oil is coming out seems to do the trick. 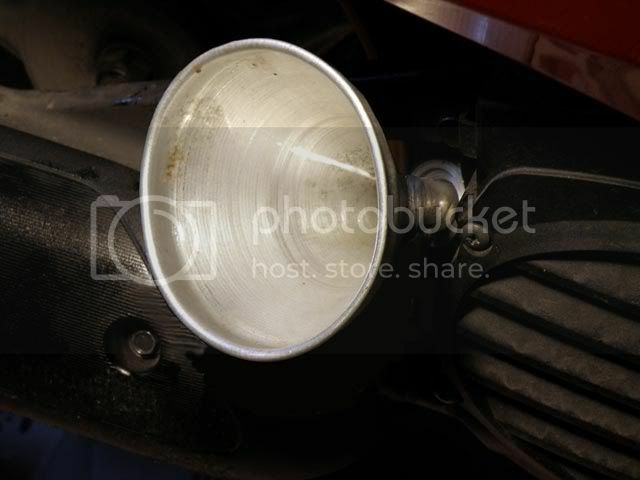 See my post at http://www.urbanscootin.com/forum/viewtopic.php?f=2&t=16217 for an even better way to remove the old oil, using an electric pump. Intended for non-mechanics like myself, below is a step-by-step description of how to change the oil and, optionally, inspect and clean the oil screen on a Honda Metropolitan. The discussion and photos are of a 2007 Metropolitan. I’m not familiar with which years may use different parts. Comments are welcome. I will happily edit these instructions if someone detects any errors or omissions. Online, there seems to be a lack of clear, complete, illustrated instructions for performing an oil change and oil-screen cleaning/inspection on the Met. One video showing how to change the oil ( http://www.youtube.com/watch?v=zNQ3myoYxdM ) is informative but incomplete: it omits many details covered below. The steps below are based on the Honda Metropolitan CHF 50/P/S Service Manual, supplemented by the observations of others and by my experiences performing the operations. The article goes on to point out that the cost-benefit ratio is huge, given the protection that clean oil provides and the small cost of the oil. If you elect to do the oil changes yourself instead of paying someone else, the cost is even less. The consensus seems to be to change the oil on a Honda Met about once every 800 to 1,000 miles. If you ride less than that far per year, change the oil at least once a year. 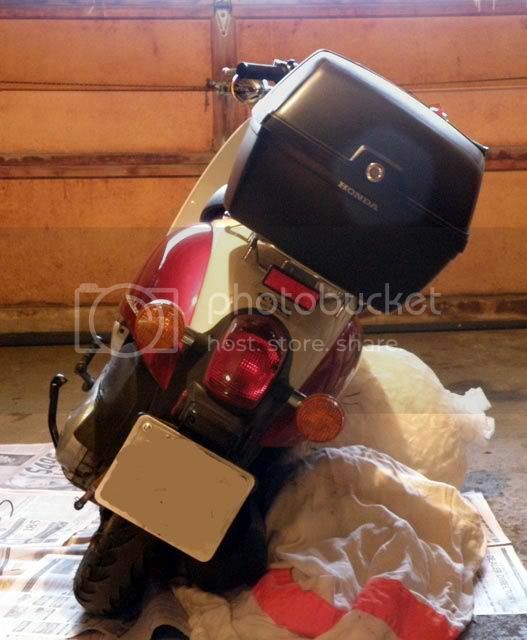 If that is the case and you live where the scooter is stored during the winter, it is recommended that you change the oil in the fall, right before storing the scooter (reference: Bustin, urbanscootin.com). 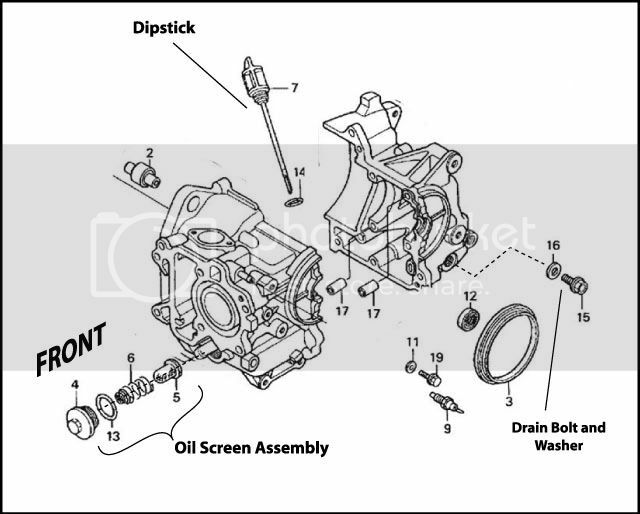 The schematic below will help you locate the three areas of interest: dipstick/fill hole, drain bolt/drain hole, and oil-screen assembly. Some portions of the original schematic have been deleted for clarity. 1. Rest the scooter on its center stand. 2. Locate the oil drain bolt. 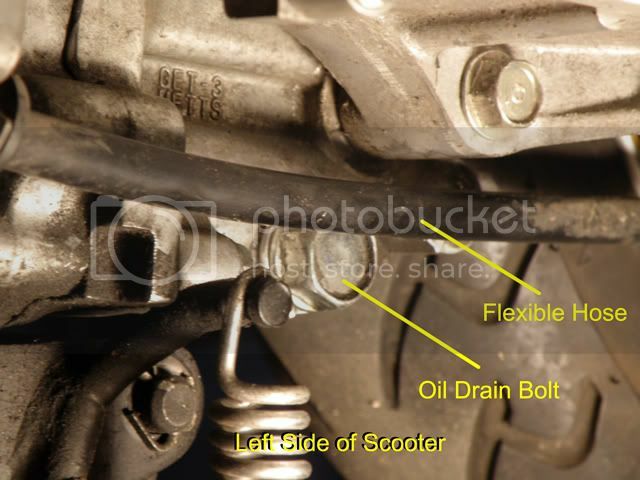 It is on the left-hand side of the scooter, low on the crankcase. 3. Place a waste-oil pan under the drain hole. Old newspapers are also recommended to catch any spills. 4. Idle the engine to warm up the oil. Warm oil flows more freely. I have seen two minutes recommended, but I let the engine run for five minutes to make sure the oil is hot. 7. After stopping the engine, wait at least two minutes to let the oil drain to the bottom. 8. Remove the oil filler cap/dipstick. The open filler tube will allow air to replace the oil as it drains, improving the oil flow. 9. Remove the drain bolt and washer. Use either a socket wrench with a 17mm socket (shown below), or a 17mm open-end or box-end wrench. 10. Allow the old oil to drain into the waste-oil pan. Some urbanscootin.com forum threads discuss the pros and cons of using a special vacuum to remove the last bit of oil. If you plan to do that, do it now. Next, decide whether you want to remove, inspect, and clean the oil strainer screen. The Met doesn’t have an oil filter; instead, it has a strainer screen that will catch only relatively large debris. How often someone does this step is a personal decision. The consensus at urbanscootin.com seems to be that once every few oil changes is sufficient. 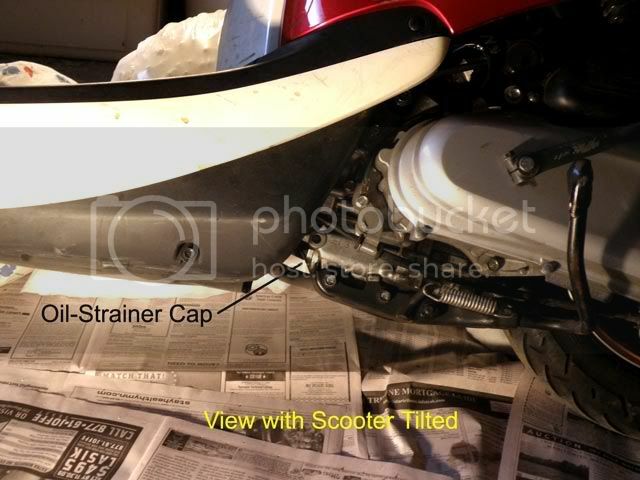 If you decide to remove the oil strainer screen, you need a way to access it, since it is located underneath the scooter (see below). 12. Unscrew the oil-strainer cap. o First, the cap is made of aluminum, not steel, so the softer material is more easily damaged. o Secondly, because there is only a finger-width gap between the strainer cap and the exhaust pipe, a socket wrench will not fit. It is highly recommended that you invest in a 17mm combination open-end and box-end wrench if you don’t have one, because it will fit in the tight space and make loosening the cap much easier than using, for example, an adjustable crescent wrench. a. 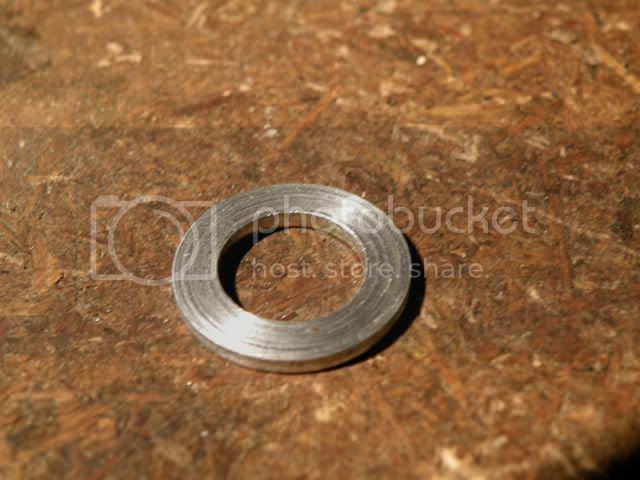 Oil strainer cap (with embedded O-ring). b. Spring (note that one end is different than the other). 15. 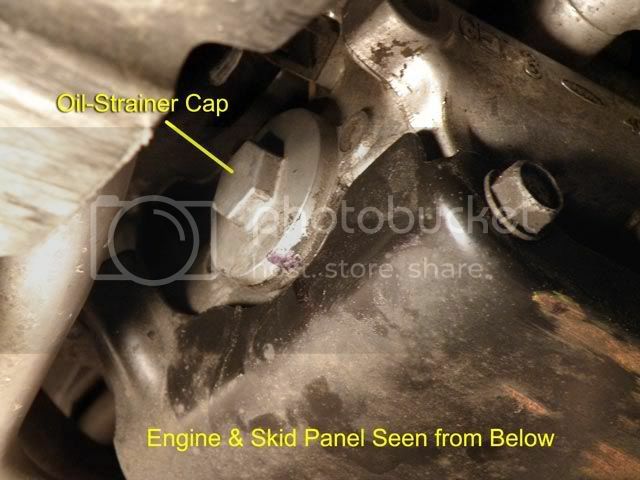 Replace the oil-strainer-cap O-ring. 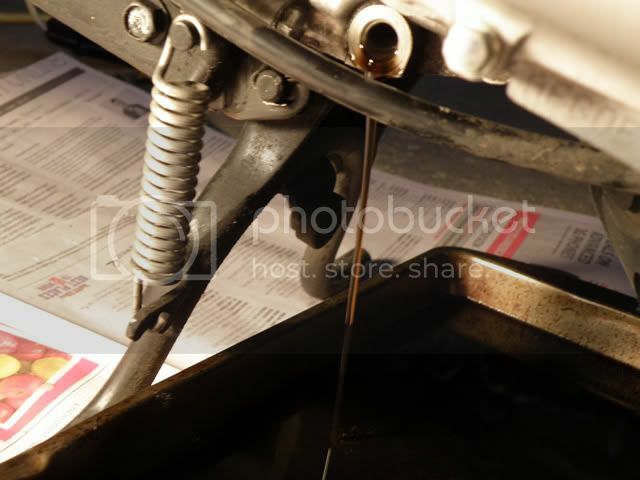 Honda recommends that a new O-ring be used each time the oil strainer cap is unscrewed. Some Met owners are less conservative, saying that the O-ring can be re-used if it looks okay; but let’s assume you are following Honda’s recommendations. O-rings are available at bikebandit.com, part number 243765-001, for about $3 each, plus shipping. a. Remove and discard the old O-ring. b. Coat a new O-ring with clean motor oil. c. Fit the new O-ring into the groove in the oil strainer cap. 16. Re-install the drain screen, spring, and cap-with-O-ring, in that order. 18. Fill the crankcase with 0.6 US Quarts (19.2 fluid ounces) of 10W-40 motorcycle-grade motor oil. Note the phrase “motorcycle-grade.” The consensus seems to be that because small engines are hard on motor oil, you should use oil especially formulated for motorcycle/motor scooter engines. Note: In the comments below, Bustin suggests re-filling to the middle point on the hash marks because of perceived improvements in performance with less oil. My research hasn’t found any empirical studies to support this assertion, but the theory seems to be that less oil means less resistance (Bryan, comments below). Less oil certainly cannot hurt, as long as you check the oil level regularly and don’t let the level drop below the middle point. One approach is to mark a transparent container at the 19.2 fluid-ounce level (or whatever level you are shooting for), add clean oil to that line, and then slowly pour the oil, with the help of a funnel, into the filler hole on the right-hand side of the scooter. Clean out the container to use for future oil changes. 19. Use the dipstick to check the engine oil level (do not screw in the dipstick while checking). 20. 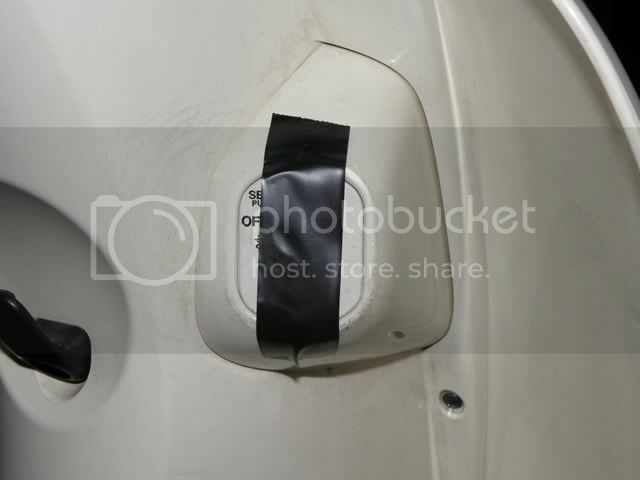 Check for leaks: Now you can remove the tape covering the ignition. 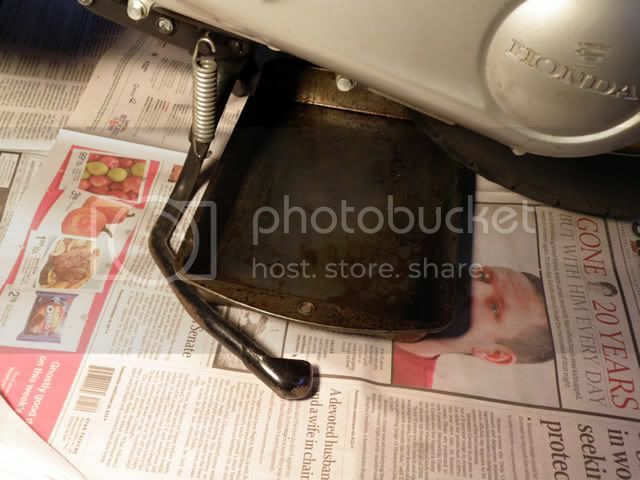 Place newspaper under the scooter, and idle the engine for several minutes while watching for any leaking from either the drain hole or oil-strainer cap. 21. Stop the engine. Let it sit for a couple of minutes. Then, recheck the oil level (don’t screw in the dipstick); if necessary, add a very small amount of oil and recheck with the dipstick, repeating the process until the desired level is reached. It’s not a bad idea to keep clean newspapers under the parked scooter for a few days, periodically checking for oil stains on the newspapers. Hope this discussion is useful for any non-mechanic considering doing an oil change on a Met for the first time. Last edited by BSquared18 on Mon Nov 24, 2014 8:55 am, edited 11 times in total. I just snugged my filter cap on with a box wrench, about the same torque as it came off with. 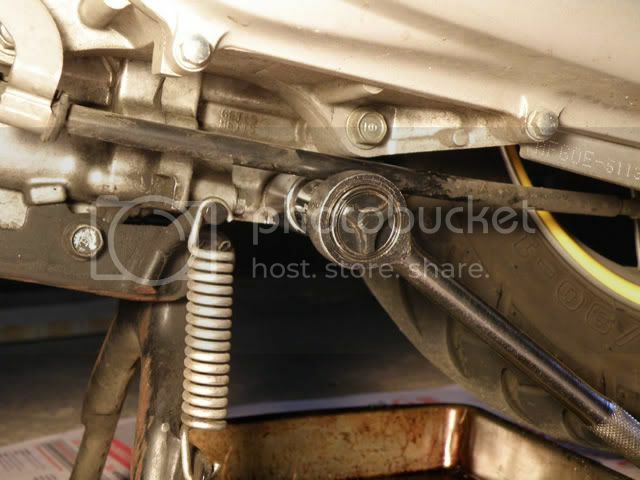 The drain bolt is always torqued with a wrench, to avoid a broken engine block. On the torque wrench - the one shown in the picture is too big (cannot read accurately to the spec) but overall your post is a real help for those who might want to get into servicing their own bike. A noble contribution to the fourm. Thorough, informative and no talking down to newbies. I copied the topic, all of your post, Bill, plus FO50's comment to the Mainnenance and Mod Procedures section. That way it will not get buried as more posts are added to this topic area. Further down fromt hat post are links to videos showing similar wrenching tasks in living color, real-time, hands-on and narrated. Don't miss the Procedures section. Good job that helps everyone. Compare a labor of intelligence and resourcefulness in this post to some of the bickering that rises occasionally in the fourm and you get a very good idea of what it takes to be a highly valued member here. Right! Putting that cap in a vice would be a very bad idea! If I understand him correctly, he was suggesting that you use a same-sized, expendable bolt to practice with, not the actual oil-strainer cap. Truth be told, I know next to nothing about torque wrenches and picked this baby up for $3 at a garage sale. Since the scale starts at zero and includes the desired 18 foot-lbs in its range, I assumed it would suffice for my purposes; using it resulted in a bolt tight enough to have no leaks without cracking the block. Do others concur that the pictured torque wrench won't do the job? (Respectfully, Flatout, I'd like a second opinion before spending additional money.) If yes, can anyone recommend a brand/model that will work? I see a lot of them advertised on Amazon.com. For example, one has a zero to 60 foot-pound range. I'd rather not pay an arm and a leg for one and probably will never use it for anything other than working on my Met. I was just trying to help and your post was excellent. I do a lot of work calibrating and tracking data on torque wrenches. Generally you want to use the wrench between 20 -80% of it's useful range, ideally near the middle, if you're using it for repeated operations. The Craftsman I have is a click type, and more than good enough for work on the scoot and whatever. I convert to inch pounds for smaller fasteners. A beam type like the one you have is fine, it's just the resolution or least readable number is too big for that application. For torquing bigger and stronger fasteners like car wheel bolts it's fine. The most important thing is you got the job done successfully without pulling threads out, cracking the block or having a leak. I wish I was lucky enough to find one like it at a garage sale! [I didn't even torque my filter cap with the wrench because I couldn't get in there without pulling the exhaust off, and I wasn't going to do that for a filter that's not worth much, knowing I could do it successfully]. Like I said earlier, you did a fine job with the post. And I read the part about the practice bolt a bit too quick. Beam type is around $11 at Auto Zone. BSquared18 wrote: Do others concur that the pictured torque wrench won't do the job? It will be fine, but it is the widest range that I'd want to use for the job. The one tortoise links is probably not accurate at that range. On yours the 18 ft/lbs is 18% of full range, on the other it is 12%. You generally try to stay in the mid range of a torque wrench's range. Too low and you'll be inaccurate. 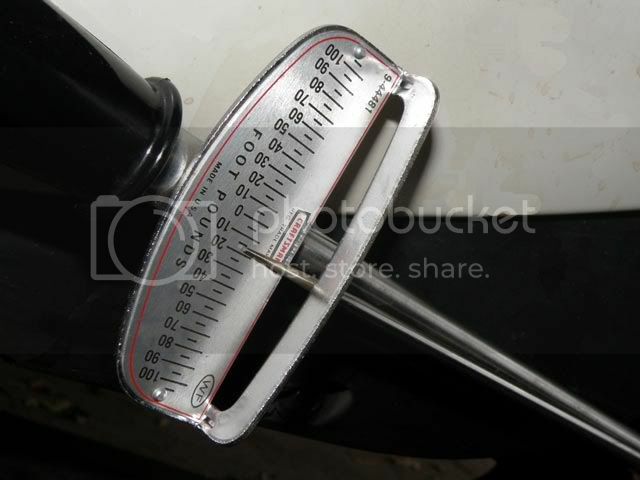 (Example: weigh a 2 pound object on your bath scale accurately. Now instead, put you on the scale with and without the object. You'll be more accurate the second way. Even more accurate if you weigh the 2 pound object on a kitchen scale of 0-5 pounds.) Too high and you are at the less accurate range of the spring. I have three torque wrenches that cover ranges for their intended use. A big 1/2" drive 20-150 ft/lb for suspension work, a 3/8" drive 10-75 ft/lb for mid-range work, and a 3/8" drive 20-250 in/lb for small parts and engine internals. Beam style are more sensitive, but easy to get out or spec. I use the snap type because they are easy to use in situations where you can't see the scale. Those a frequently on sale $10-20 off. Having said that, I don't generally use a torque wrench on oil plugs. I've just done them for years and do it by feel. Check the oil after you have run the engine, use a 6 inck long box end wrench and tighten half a grunt. Bryan wrote: tighten half a grunt. That is the easiest strategy! Using a ratchet DRIVER, as compared to a ratchet wrench, reduces "torquing". The $15 Husky stubby tool set (includes a 17mm socket) sold by Home Depot is one candidate, although a supplemental 1/4" to 3/8" drive adapter is needed. A supplemental 3/8" drive universal also greatly increases the applications of this set. Nice write up , very helpful for a fledgling DIYer ! The only thing I do different is in regards to oil capacity. If I put 0.6 quarts of oil in my Met , it's right at the very top of the dipstick, maybe even slightly over the top hash mark . Not so good, since mine runs better and goes faster if I run it about halfway up the hash marks , which ends up being about 500 ml. or about half a quart. I've heard this echoed from other veteran riders, as well. I don't think cleaning the screen really drains any more oil from the motor , at least not that I have noticed. Bustin wrote: mine runs better and goes faster if I run it about halfway up the hash marks.... I've heard this echoed from other veteran riders, as well. Fascinating! Since starting this thread, I've learned a lot from the comments, which is what this forum is all about! Any theories as to why the scooter would run better with less oil? I'm not looking forward to sucking the excess oil out of the reservoir with a soda straw. Excellent post! Thanks for the clear photos and step-by-step instructions. This is going to save a newbie some grief down the line. First off, Bill, great technical writing. And the pictures couldn't be any better. I like the black&white schematic breakdown of everything. A+ manual! Is it ok to use HP4 Hi-performance 4-stroke motorcycle oil SAE 10W-40 SJ in the CHF50? It is a Synthetic/Petrolum blend without Moly.